It may be limited to the Japanese PC release of The Phantom Pain, but it seems Konami is placing an expiration date on MGSV‘s microtransaction-based currency. The term “microstransaction” is often seen as a foul word among gamers. The microtransaction model involves the player purchasing any in-game item with real-world currency, which is immediately delivered to the player. Not to be confused with DLC, microtransactions are typically relegated to “consumable” one-time-use items and inexpensive cosmetic accents or costumes. A shifty application of the model, many titles- primarily on mobile platforms- use the microtransaction model as a way to “unlock” more time within the game at hand; the player can only access the game for a preset amount of time, unless he or she is willing to pay for a few extra minutes. Microtransactions also gave rise to the phrase “pay-to-win”, as some titles allow the players to buy powerful late-game items, rather than unlock them through conventional methods. One of the more common practices, microtransactions can be used to acquire in-game currency. Street Fighter V is the most recent example, as players can use real-world money to purchase in-game currency, to then be used to purchase in-game items. Killer Instinct, Destiny and GTA V are among many popular games to include microtransactions as a way to acquire in-game currency. For the first time in the franchise’s 28 year history, the final chapter of the Kojima-lead Metal Gear [Solid] saga features microtransactions in the form of MB Coins. While MB Coins can be obtained in small amounts as a daily login reward, the in-game currency is purchased using real-world money; MB Coins can be applied towards decreasing the development time for FOB and Mother Base platforms, or for an instant Dispatch Mission completion. Players can also purchase “Base Insurance” for their online Field Operating Bases, diminishing the overall value of lost resources after a successful enemy invasion. 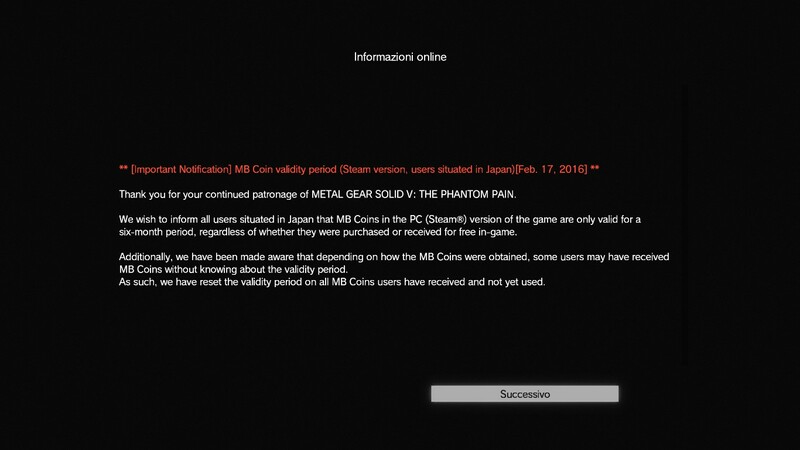 As of this time, MB Coin expiration only applies to the Japanese PC version of The Phantom Pain. Konami has yet to release an official statement regarding the future of MB Coins for the console versions and international releases. Metal Gear Solid V: The Phantom Pain is available for PC, Xbox One, PS4, PS3 and 360. They are dropping support of the game, let’s face it! MGSV is on its way to being shut down.